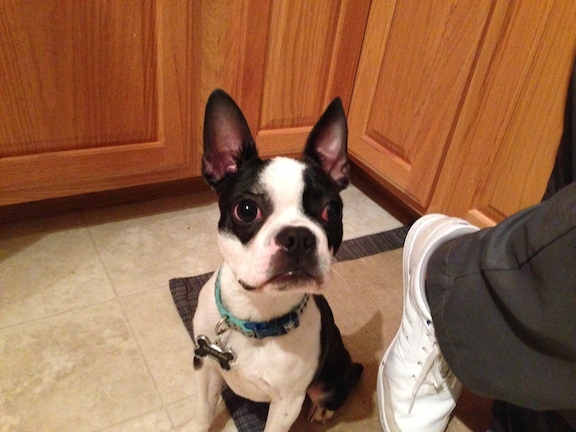 This is Bogey, a seven-month-old Boston Terrier puppy. His owners called me for help with potty training, but I could tell he was severely lacking confidence the second I met him in person. Bogey barked at me from a distance, looked extremely stiff and didn’t stop moving unless he was as far away from me as he could get. I ignored the dog completely and discussed the situation with his owners. Usually ignoring an insecure dog can help it calm down and once its curiosity kicks in, its not long before its investigating the new person who isnt paying any attention. Not Bogey, he stayed far away so after the conversation with his owners I held out a meat treat with a strong scent. Bogey picked up on the smell of the treat, but stayed away. I got down onto the floor and help the treat out to my side while looking away, but even this was too much for Bogey. Eventually I sat down on the floor and tossed a treat a few feet away on the floor to my side while i continued to look the other way and remained completely still. As I was able to get Bogey to come get a treat tossed about six feet away from me, i repeated the process but placed the treat a few inches closer to me each time. After about 15 minutes I was able to get him to take a treat placed right next to me, but his body language was practically screaming at me how uncomfortable he was. His owners informed me that the breeder had kept Bogey inside a kennel pretty much 24 / 7 for the first five months of his life. That horrible situation was most certainly a huge part of why Bogey lacks confidence and why he has had his accidents in the house. Dogs will normally not sit in their own excrement, but if confined to a small kennel with no place else to go, they have no choice and this can become a behavior problem later in their life. The effects that an abusive upbringing can have on a dog is heartbreaking to see. But the great thing about dogs is that they live in a the now. Now that he lives with a dedicated and loving family, Bogey’s chances of a full recovery are very good. But because he was so fearful of anyone he didn’t know at this point, I decided to coach his owners through a simple recall exercise. I had the members of the family sit in a big circle on the floor and handed some of the high value treats to each person. After demonstrating how to call Bogey, I observed the members of the family as they took turns calling the dog. He was so unresponsive that I asked his owners if they had ever had his hearing checked. As the session went on, I witnessed him responding to sound only, so Im pretty confident he is not deaf. This leads me to believe that Bogey is simply so insecure that he shuts down as a coping mechanism. As we practiced the leave-it exercise, Bogey’s confidence level started to rise. The improvement was welcome, but it was made in very small steps. Once I learned that he didn’t even know how to sit on command, I shifted gears and showed the members of the family a few different ways to encourage him to sit and how to reward him when he did. After some practice and many, many treats, Bogey started to sit. Not consistently and not every time, but I could see he was putting 2 and 2 together. I suggested his family practice asking Bogey to sit as often as possible. A great way to help rehabilitate a dog that lacks confidence is to teach them new tricks or commands. To that end I suggested that they progress to stay, then lie-down once he masters the sit. As he is rewarded for complying to given orders, he will start to gain confidence in himself and his family. Because I was called in to help with his potty training issues, I went over a few tips and detailed the times a dog is most likely to need to go. By taking the dog outside after it wakes up, after eating and after any play sessions, we have a better chance to have a successful elimination outside. I suggested that they reward Bogey warmly, but calmly any time he eliminates outside. By rewarding the action or behavior we want to encourage, we can condition the dog to equate going outside as making his pack members happy. This is almost a new skill that when mastered, will also help with Bogey’s confidence. Next we went out for a short walk so I could give the members of the family a few pointers on how to be a leader on a walk. The family’s preteen girls took turns walking Bogey who fell into a nice heel and only needed a few corrections. I suggested that they incorporate a sit command every few steps once Bogey masters that command inside. By combining multiple commands and exercises together, we help solidify the dog’s ability to execute the command as well as reinforce that following commands or instructions is a good thing. By the end of the session, Bogey’s body language was much better. He was able to take treats out of my hand and didn’t run away when i spoke or moved. He isnt out of the woods yet. His accidents will likely continue, but if taken out at the right time and rewarded properly when he eliminates in the great outdoors, his accidents will decrease and eventually stop completely. But before that can happen, his family will need to patiently teach him so he can regain his self esteem and confidence.